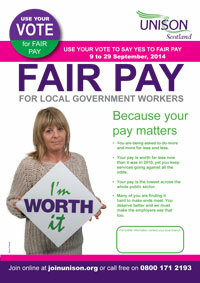 The Local Government Committee yesterday considered the outcome of recent ballot on Pay. You will recall that members voted to accept the new proposals from CoSLA by 70.8% to 29.2%. It was agreed that this result concluded pay for 2014, however branches and members are to be congratulated at the pressure that was brought to bear on the employers to force them to improve upon their original offer. The strength and influence of UNISON was very clearly demonstrated, given the GMB and Unite played no part in this dispute. UNISON will be writing formally to the employers accepting the new proposal. However no sooner has pay for this year been settled, then it is time to lodge our claim for next year. The Local Government Chairs Group will meet on Monday 10th November to consider how best to consult branches on what next year’s claim should look like. We will also seek to draw up a joint trade union side claim along with the GMB and Unite and hope that next year’s pay negotiations can be conducted as a joint trade union side with a common purpose of seeking to improve our member’s pay. Further information on next year’s pay consultation will be issued shortly. The Scottish Local Government pay ballot closed yesterday and the results were as follows: Members voted 70.8% to accept and 29.2% to reject the revised pay offer. The LG committee meets tomorrow 5 November. A further update will be circulated thereafter. 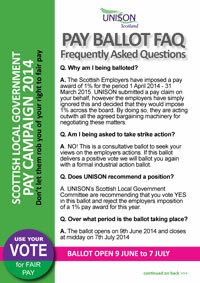 The Consultative Ballot on Pay will run from 20 October until 3 November. Members who do not receive a ballot paper should contact UNISON Direct on 08000 857 857. This Helpline will only be available from 24 October – 30 October. UNISON has called off the strike action planned for 21st October 2014, while we consult our members on an improved offer from the local government employers (COSLA). •	An end to low pay. The consolidation of the Living Wage and deletion of spinal column points below the level of the Living Wage. Some council’s make up the living wage through a low pay bonus. UNISON has made significant progress on 2 of these demands. On low pay and getting back to the bargaining machinery. And we will use that commitment to get back round the table to continue to fight for fair pay. UNISON has also received a commitment from COSLA to reinforce their commitment to joint negotiation and to adhere to the collective bargaining. We have agreed a form of words with COSLA which says ‘our principle aim is to reach mutual agreement based on our shared values on a national scheme of pay and conditions’. This was a difficult decision for our branch secretaries but we remain united. We should not underestimate the anger amongst local government workers at the way they have been treated. They have seen a 14% reduction their pay since 2007, they have seen 40,000 jobs lost and they are the only sector which has actually seen a cash cut to services – all in all meaning our members live with the stress which comes with having to do more work for less money. UNISON is one of the biggest democratic organisations in Scotland. Decisions are made by our members. And we have consulted our membership every step of the way. And we will continue to do so. We think we have made real progress; this is a victory it shows what we can achieve when we work together. The fight for fair pay continues. UNISON members in local government in Scotland have voted to take strike action due to the employers ignoring the agreed bargaining machinery, the imposition of a pay award and their failure to negotiate on UNISON's pay claim. The first strike day will be Tuesday 21 October. I am writing to ask you to take part in the strike and send a strong message to the employers that you will not accept the employer's behaviour and that you want fair pay. 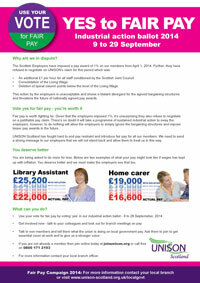 UNISON's aim is to get an improved offer for you. Taking strike action might seem like a big step, especially if it is your first time. However, I would urge you to take part, alongside thousands of your fellow UNISON members. If you face hardship from taking strike action, you can seek help from UNISON. The actions of the employers in ignoring the agreed bargaining machinery and imposing a pay award in April this year is unacceptable and threatens the future of collective bargaining in Scotland on pay. The 1% award imposed on 1 April this year does not keep pace with price increases and is in effect a pay cut. We have been forced to take action as a last resort after all attempts to negotiate have so far failed. We want to get the employers back to the negotiating table with us, but at the moment they are not prepared to do that. As a union committed to providing quality public services, we regret the potential disruption our strike might cause. The services you provide are essential to the whole community, but you deserve better than what is effectively another pay cut. We need to show the employers that we are prepared to defend our pay and to send a message to the government that enough is enough. They can't keep cutting services, jobs and pay and expect us to accept it. Please make a stand on 21 October. A well-supported strike is vital if we want to get the employers to listen to reason and show you the respect you deserve. * Press release 6 October: UNISON announces a national programme of industrial action in local government - UPDATE strike set for 21 October. 4 October 2104: Following the ballot vote for action, UNISON Scottish local government leaders have sought authority from the union's industrial action committee for a programme of industrial action over the coming months to include a day of action followed by a programme of geographical/selective action. Branch consultation will kick off next week. UNISON lead negotiator Dougie Black said: "Members are angry about the way they have been treated. Their pay being eroded whilst theytake the brunt of the cuts. We urge employers to come back to the negotiating table." 29 September 2014: The Local Government Pay Ballot, which closed at lunchtime today, 29 September 2014, has delivered a Yes vote for industrial action on the basis of 53.5% to 46.5%. UNISON Scotland's Local Government Committee will meet in Glasgow on Friday 3rd October to discuss the way forward and a full update with follow then. The Scottish Employers have imposed a pay award of 1% on our members from 1 April 2014. This action by the employers is quite unacceptable and shows a blatant disregard for the agreed bargaining structures and threatens the future of nationally agreed pay awards. Given that the employers imposed 1%, it is unsurprising that they also refuse to negotiate on a justifiable pay claim. Because of this UNISON Scotland are now conducting a formal industrial action ballot which will be open from 9th September 2014 until 29th September 2014. The ballot asks members whether they are prepared to take strike action to force the employers to respect the joint negotiating machinery and return to the negotiating table and improve upon the offer. As the ballot date approaches, UNISON branches are being urged to lobby councillors across Scotland to persuade them that local government workers are due a decent pay rise. A briefing has been emailed to all branch secretaries with action points and a draft letter. If you have not got this, or it has gone astray, email t.hamilton@unison.co.uk or john.stevenson@unison-edinburgh.org.uk for an electronic copy. Posters, leaflets and other campaigning materials will be available on the website later this week. Members in Scottish Local Government will be balloted on a programme of industrial action in support of an improved pay offer in September this year. The ballot will open on 9th September and close on 29th September. Industrial action options are currently being considered but it is likely that it will start with a day of action by all members in the event of a successful ballot. This is an important time for our members, cuts to services are a reality in all local authorities, jobs continue to be shed at an alarming rate, terms and conditions are under threat and those members that are left are required to do more for the same or less. On top of this the Scottish Employers have imposed a paltry pay increase. This has not been negotiated it has simply been imposed! Pay remains a priority for this union now is the time to give that message to our employers and tell them that we will not be treated like this. A group has been established to develop our campaign and provide the resources and support for branches to engage with members. Further details will be announced on the website in the coming days. 8 July 2014: The Consultative Ballot on Pay closed yesterday with members voting by 65% to 35% in favour of moving to a formal industrial action ballot in support of an improved offer. UNISON's Scottish Local Government Committee has agreed to now progress with the preparatory work for an industrial action ballot and to have discussions through a meeting of all Branch Secretaries as to the campaign and strategy required to maximise participation and win the ballot. The Branch Secretaries meeting will take place before the end of July once a venue can be confirmed. Further information will be forwarded shortly. 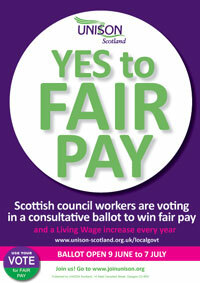 UNISON Scotland council workers are voting in a consultative ballot to win fair pay and a Living Wage increase every year. A 1% pay increase imposed by the employer. UNISON’s pay claim ignored while your living costs soar. Yet the richest 1000 people could pay off the UK deficit three times over. A Fair Pay rise and a promise to increase the Living Wage every year. FACT: Local economies need a boost. so it would be good for the local economy. FACT: Councils can afford it. In recent years councils have saved around £860 million by reducing staff costs. It's time for the employers to come clean and pay up. They can afford it and council workers deserve it. Council staff contributed hundreds of millions of pounds in efficiency savings. We are overstretched as more than 39,300 local government jobs have been lost since 2008. This puts pressure on everyone and increases stress levels. Yet we continue to provide quality public services. We have earned a decent pay rise. 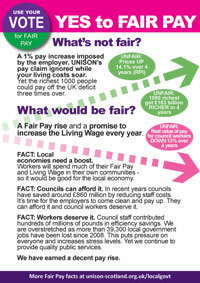 A5 leaflet - Yes to Fair Pay! 27 May 2014: UNISON Scotland Local Government leaders have announced a consultative ballot of members in local government on pay. The ballot will run from 9 June - 7 July. It will be a postal ballot to members home addresses and UNISON's Local Government Committee is urging members to support a full industrial action ballot. 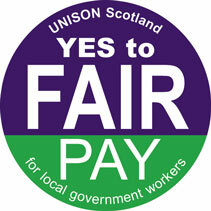 The Scottish Employers have rejected UNISON’s 2014 Pay Claim for £1 per hour and consolidation of the living wage. It is their view that pay has been settled until April 2015. This is because, after UNISON members accepted a 1% rise in 2013 in good faith, the employers imposed 1% for 2013 and 2014. Consult members regarding the employer’s rejection of our pay claim with a view to campaigning for and winning a ballot for industrial action in support of an improved offer. Seek to build a campaign of engagement with members over the issue of pay with a view to developing a pay claim to be lodged in November this year for the period 1 April 2015. This to include promoting a number of pay related events throughout 2014. Scotland’s essential services is worth far less now than it was in 2010 yet they keep services going against the odds. Councils have imposed a 1% rise for 2014, meaning these workers will be 16% worse off since 2010 while the top 1,000 people will be an amazing £190 billion richer. UNISON says Scotland's local government workers deserve better and we are launching a new claim for 2014 - because they’re worth it!